Yep, you guessed it, another Primark post! safe to say it felt very strange... and I felt extremely short. If you had seen on my latest Primark haul these items shall look a tad familiar to you's! The fact that you've followed us on bloglovin is MASSIVE! I absolutely love your blog and style so thank you very very much! this outfit is amazing btw! i wish i could pull yellow-mustard jumpers but with my blonde hair tone i think i'd look like a chicken! Great shots! I can't believe you got on the tracks! I would have been scarrreeeddd! You are so adorable! 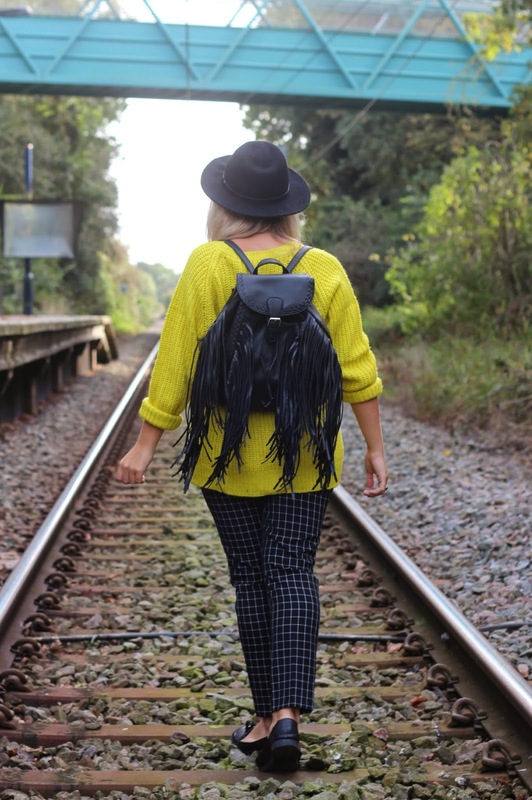 I really like the fringes on the backpack because the way they fall reminds me of wings. I love your outfit! Beautiful pictures! I've been looking for trousers just like these for ages - who knew the perfect pair would be in good old primarni!? Love the outfit! I love these photos so bloody much.